Reprint. Originally published: London: Fourth estate, 2002. Sixty-five million years ago the dinosaurs were destroyed in a mass extinction that remains unexplained. Out of that devastation, new life developed and the world regained its equilibrium. Until now. Employing radically new perspectives on the science of life, scientists are beginning to uncover signs of a similar event on the horizon: the end of man. In telling the story of the last sixty-five million years, Michael Boulter reveals extraordinary new insights that scientists are only now beginning to understand about the fossil record, the rise and fall of species, and the nature of life. According to Boulter, nature is a self-organizing system in which the whole is more important than its parts. The system is self-correcting, and one of its tools is extinction. If the system is disrupted, it will do what it must to restore balance. 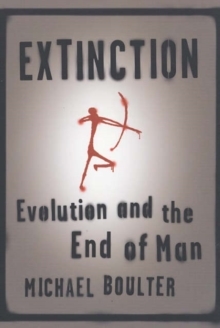 This book is a thoroughly researched introduction to the new developments in the science of life and a chilling account of the effects that humans have had on the planet. The world will adapt and survive; humanity most probably will not.